Pizza is always a good idea, even more so on Friday’s when you don’t want to be spending more time in the kitchen than you should. We like to end of the week on an exciting note, which is a tradition my mom started when we were growing up and I’ve tried to carry this with the kids . We knew that Friday’s would be reserved for treat meals. I’m excited to share my latest Royal Baking Power inspired recipe, which took me by surprise as usual… super quick and easy to make. 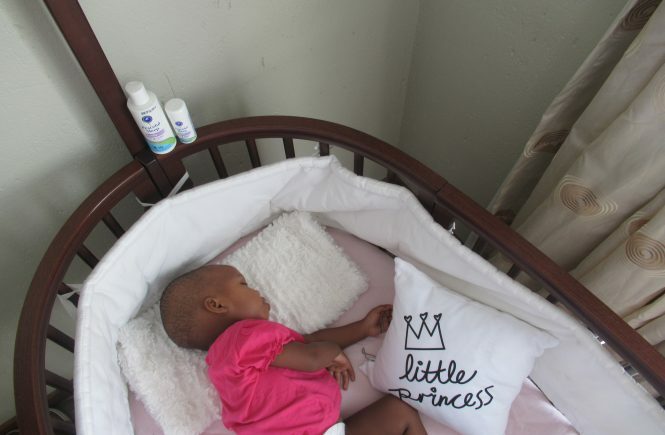 Lesedi is getting super impressed with me. 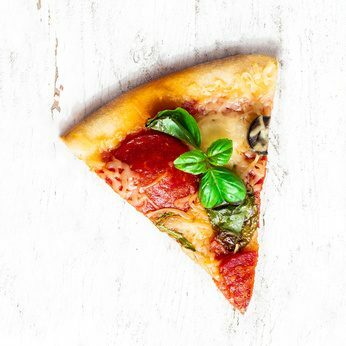 What I loved most about making our own pizza was the customization – for instance, one could use gluten-free flour and also size and shape it the way you want. It took me 10 minutes to prepare and the baking took 15 minutes, yup, that’s quicker than a delivery! Moms with fussy eaters will love this part – you know your little ones best, so go crazy adding their favourites. As a base, we used tomato paste, grated gouda cheese, bacon, sun dried tomato’s and chorizo sausage. You could use feta, salami, mozzarella, mince, mushrooms, peppers, olives, etc. Sift flour, Royal Baking Powder and salt together. Rub in butter with fingers until mixture represents fine breadcrumbs. Whisk egg and milk together. Add to dry ingredients and cut it with a knife. Knead lightly to a soft dough. Divide dough in half and roll out each piece on a lightly floured surface to a thickness of 5mm, keeping it to a round shape/sqaure. Place dough on greased baking trays. BUT remember, this is the fun part, you can be as creative as you want. As you will see, I created smaller square portions for Khumo. 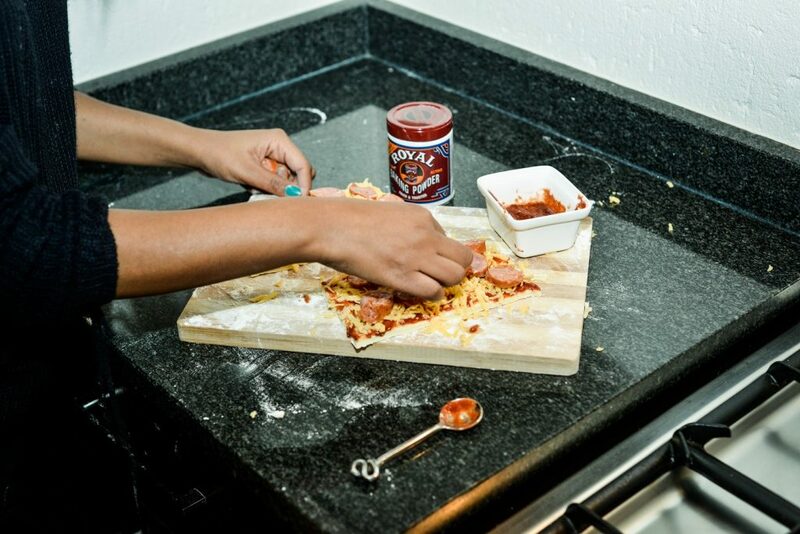 Add your toppings and bake at a preheated oven at 200◦ for 15 minutes. Sprinkle basil over and serve immediately. Don’t worry about perfection, focus on making it a fun experience, with a tasty outcome. Trust me, the kids wont judge you. 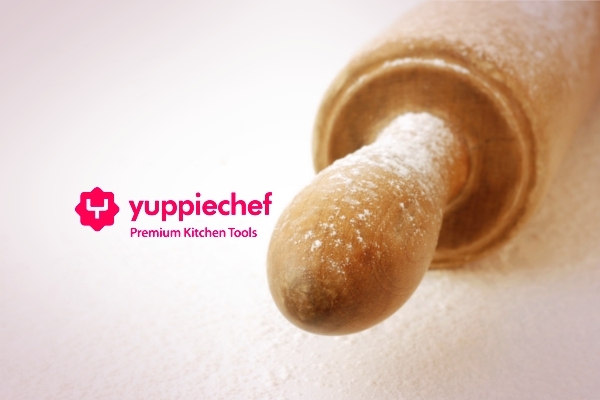 WIN: Royal Baking Powder would love to spoil one lucky reader with a R1000 YuppieChef gift voucher to shop your favourite baking goodies and more! 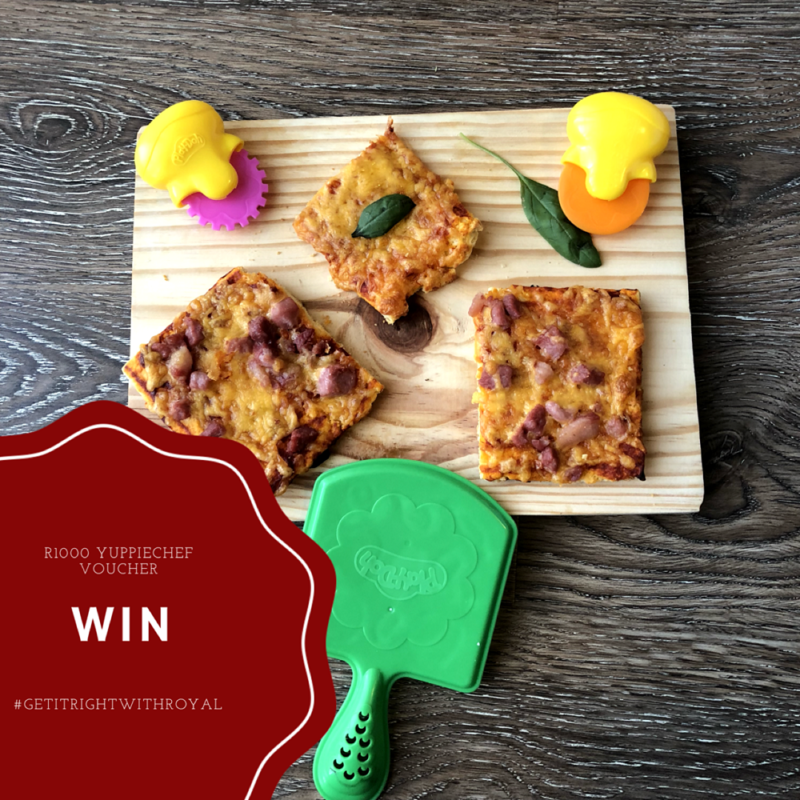 To enter, leave me a comment telling me why you love Royal Baking Powder? Giveaway will be open until 18 July 2018. 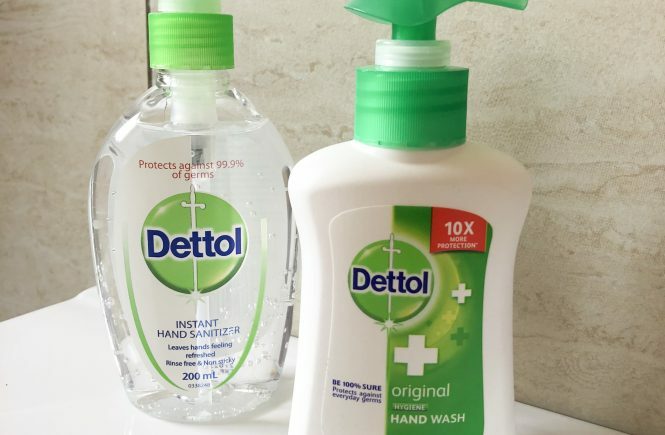 Only open to South African Residents. Winners will be notified by email. Prize is not transferable and may not be exchanged for cash. 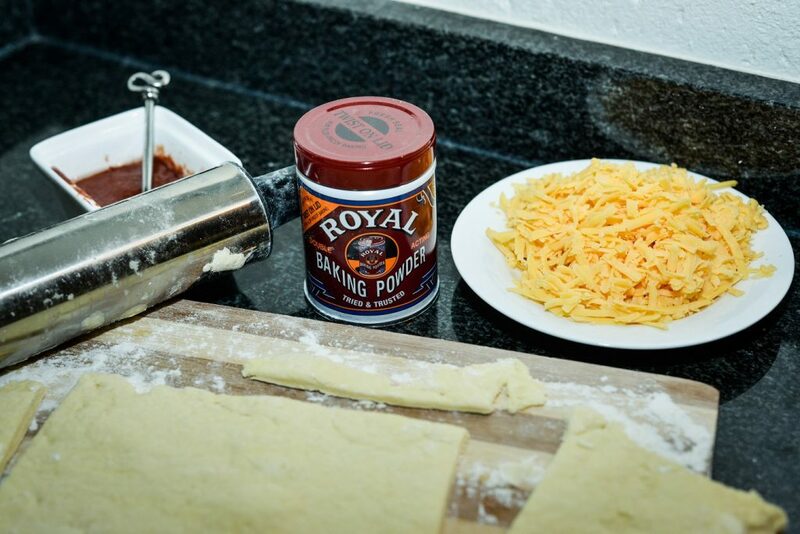 I love Royal Baking powder as it is the best brand on the market. I didn’t realize pizzas are so easy to make. Think we will give it a go this weekend! I love my royal baking powder because its been around for years and it never lets me down in all ny baking! My late Mom swore by Royal Baking powder as none of her bakes were ever a flop. So to continue the tradition of non flop baking- I always use Royal baking powder. Is there even another brand for baking powder except Royal? Royal baking makes baking fun and easy! I have never been disappointed when baking something with Royal baking powder, whether it be cakes or crumpets for breakfast!! We tried the pizza, what a hit with the whole family!! 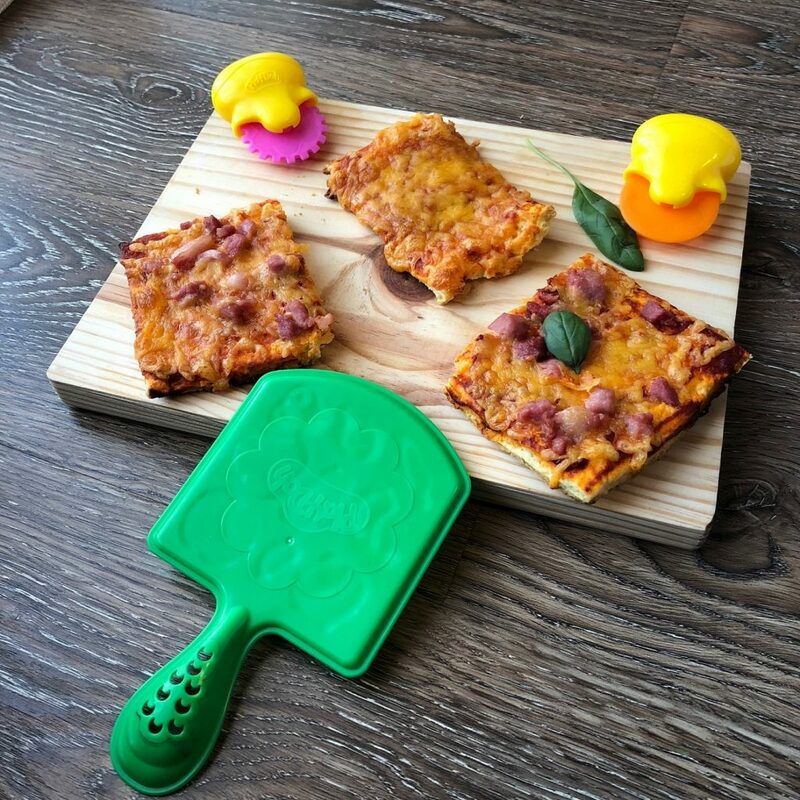 I was totally inspired by this pizza recipe, I made it for the family last night and it was a hit 🙂 – I had never thought of making homemade pizza before. 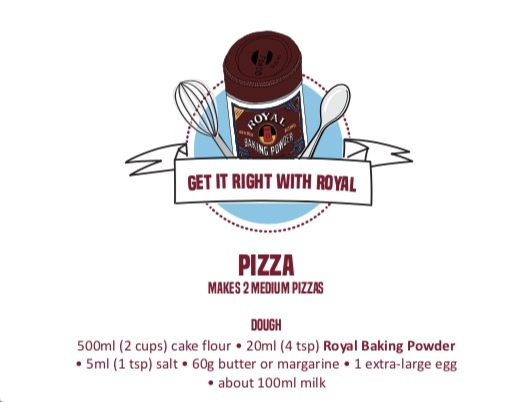 I love Royal Baking Powder because I am guaranteed of a perfect outcome to my baked goodies everyttime, whether I am making scones or pizza.